Each year I teach a section of "Humanities and the Expressive Arts," a core course in Fairhaven College's curriculum. As a teacher trained in American literature and culture, and in creative writing, I have usually focused on the literary arts�novels, poetry, nature writing, personal essays�and have utilized the methods familiar in such courses: critical analysis, interactive discussion, reflective essays. The first couple of years I taught the course, I rarely spent much time on the expressive arts, yet began to wonder whether my students were missing something essential. After all, they may never take another course in the humanities and expressive arts. How could I get them excited about the possibilities the arts had to offer them? In Winter Quarter of 2001 changes occurred in a course that shifted my teaching in some new and exciting directions. That quarter, in addition to the "Humanities and Expressive Arts" course I was teaching, I was also co-teaching a 15-credit course on the American Southwest with my colleague John Bower. After four weeks of intensive studying of Southwest culture and literature, the students left for a 5-week journey through the Southwest with John. I stayed in Bellingham to teach my Humanities course, yet I would be joining John and the students in the Southwest for 10 days in the middle of their 5-week journey. What could I do with my Humanities course while I was gone? One option was to get guest teachers to fill in for me. Another was to assign a writing project or paper to be completed by my return. Neither of these options seemed right, though. 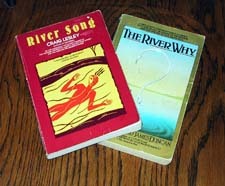 Instead, I had the students choose one of two novels to read�David James Duncan's The River Why or Craig Lesley's River Song (the theme for the course was "wildness, water, and words"). Make sure everyone in the group contributes. Divide up the tasks. Let your imaginations run wild. Collaborate. Dream. Create a performance that will get at the heart of your responses to the book. You will probably have to meet outside of class time to fully prepare your performance piece. Be creative. You can use any means of expressive arts you would like: music (songs, instrumental), theatrical performance, storytelling, video production, role playing, costumes, oral intrepretation, dance�or a combination of these and more. Use the book as the inspiration for your group performance piece, and let your performance be a way to share what the book meant to you, taught you, and did to you. I then left the students to themselves for 10 days while I went to the Southwest. Each of the two groups consisted of 10 students, and group dynamics and planning proved to be challenging. One student later wrote: "Finding ways to be included and inclusive in the group process provided insight into group dynamics. It was challenging to balance patience and motivation." He felt that there was not enough time for his group to fully develop their performance and that the performance "didn't convey the book's message with much depth." Others, however, felt that "it was an amazing process to design a visual performance in reaction to the book," that the presentation "was a great experience," "it was the expressive arts," and that being able to approach a novel in such a way "changed [one student's] ability to communicate, to create, and to think." The performances turned out to be collage-like, a mixture of song, music, poetry, readings, and theater spliced together. I will never forget the wonderful whirling, dancing fish in the "Dance of Reconciliation," an exciting culmination of the group performance on The River Why. But there were also many ways in which the performances could have been a better learning experience than they were. One of the things I love about teaching is the way in which it constantly challenges me to stretch beyond what I know and what I have planned to consider other possibilities. It was clear that the Group Performance Project in the Humanities course had succeeded in pushing some students to new levels of creative work and expression, had challenged others to learn how to work together in such a large group, and had, at the same time, been planned too haphazardly. What went well seemed more like luck than good teaching. What I filed away, though, was that this assignment had tapped into some powerful and valuable student creative energy that I wanted to explore further. One student declared what many others felt: "My favorite part of this course was the group project. I really loved the people that I got to work with, and we had a fun book to present as well. . . . I think that our whole group worked to include everyone and we all spent a great deal of time thinking about what the book meant to us." All of that seemed quite valuable: enjoying working with others, something fun to do and create, and spending lots of time thinking about what a book means. Teaching is all about engaging in an on-going reflective process�reflecting on the course itself, the students' experiences in it, and on my own goals, methods, and performance as a teacher. This experience led me to finally articulate some questions that had been simmering inside me for a long time. One effect of teaching at Fairhaven, in an interdisciplinary context, is that I have begun to honestly question many of the assumptions and expectations I had carried with me from years of studying in and teaching in English departments. For instance, in a college class, what do we do when we read a novel together? Typically, students are asked to write a reflective essay on what they felt about the novel, or a critical analysis of the novel's themes, characters, or major issues, or to take a theoretical stance and interpret the novel through that lens. In short, we ask students to translate their thinking into words written down and turned in to us, or sometimes to read or share with the class. We also value discussion, talking about the book, the story, the themes, the passages we love and hate. Once in a while, we may ask students to write their own story in imitation of what they've read, or to take an element of the novel's form and to use that in their own story, or to let the novel simply inspire their stories. But what else is possible? Why not read a novel, and then write, design, and give a performance using one or more of the expressive arts�music, dance, theater, video, visual art? Think about how challenging and valuable such a process is�a group of people taking their collective responses to a story written in the form of a novel and then translating all that into another artistic medium, another way of expressing the story and the feelings, issues, and themes it evokes or inspires�and also how fun and stimulating, and, I believe, how central it is to the very core of what the arts are all about. Students should be challenged to make art, to create, to perform, and to participate in the humanities through their own work, not only by studying what others have done. Such engaging work will also teach students new ways to think about and understand the writers, artists, and performers they are studying. Another question this experience raised for me was: What are the best ways for students to engage in group work? At Fairhaven College, collaborative and group work is expected in many courses, and is a valuable part of our educational mission. What I have witnessed, though, in my classes and in others, is how difficult it is to create successful, stimulating, learning experiences that involve group work. Often, students who are comfortable writing papers, doing research, and giving presentations on their own, cannot work well with others on these same tasks. Some students end up doing all the work and only getting part of the credit. Some groups suffer from personality conflicts and lack of leadership. Some group projects, such as writing group papers, are just hard to do well. How many good models do we have of successful collaborative work? I began to think about the Group Performance Projects in light of the concerns I had about successful collaborative learning, and wondered how I could reshape the assignment to foster better group work. The next time I taught a "Humanities and the Expressive Arts" course it focused on the theme "Our Animal Selves"�exploring the relationships between human life and the lives of animals. In this course I attempted to be much more intentional in preparing students for the Group Performance Projects, engaging students in various performance and small group exercises. On the very first day of that class we broke up into two groups and played a game of Animal Charades. It was important to break the ice right away. Some students were challenged by having to perform in front of others. It took a tremendous leap of faith to trust themselves to performance, to the gaze of others, and to confront their own fears and resistance. What it also revealed to us all, though, was how powerfully the movement and presence of animals live in our imaginations, and if we allow it, in the expressions of our bodies. A couple of weeks into the course, we were reading Peter Shaffer's Equus. Unannounced, I had the students break up into small groups, choose a scene from Equus, discuss it and plan a performance that their group would perform that day at the end of class. Most felt rushed, but it also forced many students beyond their fears and concerns, and to try to embody what the scene meant in a more immediate and spontaneous manner. 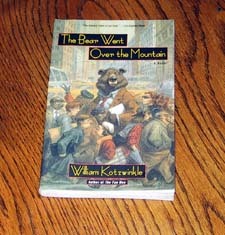 By the time we came to the larger Group Performance Projects on William Kotzwinkle's The Bear Went Over the Mountain at the end of the quarter, most of the students were ready to perform, and comfortable working with each other. These 30-minute performances were marvelous: funny, playful (as is Kotzwinkle's story) and full of wit and insight. There were puppets, masks, elaborate and inventive costuming, and lots of live performance. One student articulated what many others felt: "Group performances near the end of the quarter were stunning, creative and entertaining. They showed thoughtful humor, excellent understanding of literary materials, and reflected classroom generated discourse on animals and peoples." The same student added, though, that for him the performances were also "a personal challenge. Typically embarrassed and nervous in performance situations I was challenged by performing multiple times in class." Another student said she has "always been shy around a group of people but thought I did pretty well. It was great to overcome this fear. It gave me confidence and will help me to overcome the fear of having to express my feelings in a group." This project helped another student "let go of much self-consciousness and worrying about what people think." I began to see that the Project was not only a stimulating way to engage literature, and to foster group process and collaborative work, but it was also a way to help individual students overcome fears and gain confidence in presenting themselves before others. It was thrilling to see two of the students from this course get the courage to try out for and perform in a college musical production the next quarter. Group Size and Composition. As I was preparing this portfolio, I spent a lot of time thinking about what had worked well and what hadn't in these Group Performance Projects. One significant improvement from the first course to the second and third had to do with the size of the small group. Ten students were far too many for collaborative group work that included everyone in the process and had the kind of cohesion necessary for a successful performance. Four students seemed to be the ideal number, though it has also worked well with three and five. Why is that? It is important that each person has a significant role in the process of creation, planning, and performance. Four people allows for pairing up, two and two, on various tasks. It allows for a diversity of ideas in brainstorming, and a range of creative talents, rather than relying on only one or two people. Once a group gets larger, there are more opportunities for one or more students to be left out of the process. A student who was in a group of five in one course declared: "What a struggle! To stay true to one's vision and not trample other peoples' vision is difficult, but this experience showed me that it is possible." She was able to assert something of what she wanted into the performance, but it took a lot of work to persuade her four fellow group members. Giving Enough Time. The biggest drawback to the way I had conceived of and organized the Group Performance Projects was not giving the students enough time to develop full, rich performances. Late in the quarter the students had to read a full novel, form small groups, design and plan and performance, and then perform it. Even under such constraints, the students put together some marvelous performances and learned much about valuable group work. I wondered what would happen if the students had most of the quarter to plan and develop their performances. Why not read the novel at the beginning of the course, discuss it, even write a reflection essay on it, and then form performance groups that could work together throughout the quarter to prepare for a performance near the end of the course? This may seem like an obvious course of action to others who have taught performance or similar intensive group activities, but remember that nothing in my graduate work, literary studies, or previous teaching experience in English departments at three other institutions had prepared me to know how best to go about getting students to design a performance based on a novel�and all this in the midst of a course on the Humanities, which included many other activities, including critical analysis, writing, thematic exploration, examination of genres, and literary and artistic history. I recently taught another section of "Humanities and the Expressive Arts," this time focusing on the theme "In Wildness." Based on my past experience, I organized my course to take into consideration the things that I had learned from previous courses that used a Group Performance Project. Student Reflections from this section provide an interesting perspective from students' point of view. Let me say in closing this portfolio reflection that I will continue to teach the Group Performance Project, and have arranged to teach my next section of "Humanities in the Expressive Arts" in Fairhaven College's auditorium, so that the course itself will include more performances in all of its activities. Who knows where this will lead? But it is quite exciting to consider.